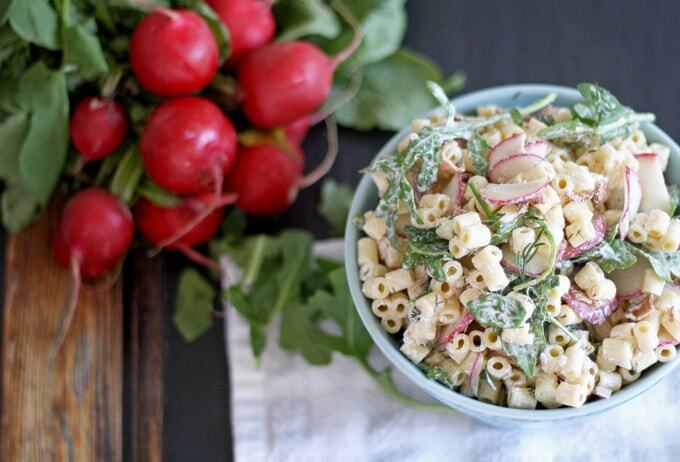 Spring is here – with it comes a spring pasta salad recipe, full of radishes and arugula! Perfect for potlucks and end of winter parties. That’s a thing, right? After months of brown grass and branches staring at me from the windows, I am thrilled that leaves and flowers are coming back again. I get so excited for spring. Winter in Chicago is months spent holed up, avoiding the cold, wind and snow. Spring arrives and all of Chicago’s inhabitants are reborn and filled with the urge to DO things. I spent so much time on the computer or messing around in the kitchen the last few months, that I forgot sometimes to have a social life. Then I spent the past few days making up for it a little bit. I went shopping with my sister on Friday and we had lunch on a patio. Al fresco dining is the best thing, ever. Then on Saturday, Mr. B and I went to a friend’s wedding. I love wedding season – my friend was an absolutely stunning bride. I’m so happy for her and her new husband – true love is such a wonderful thing to witness. Sunday, we went to my dad’s house for an early dinner/late lunch. My brother and sisters went too – it was so nice to hang out with everyone at one time. It usually only happens on Christmas and that doesn’t really count. Our “excuse” for getting together was to see their new puppy named Dakota and she is adorable. I am totally in puppy love. I went out and had “a life” and it felt good. I barely touched my computer and let the laundry pile up. I also barely cooked – ramen does not count. So today’s recipe is a low-cook one I’ve been hanging on to, for a rainy day. One of my favorite parts of spring is the return of farmer’s markets and spring vegetables. I’ve spoken in length about my love for arugula (in this recipe for a baby arugula and tomato salad and in this bacon and arugula breakfast sandwich.) It is in season in early spring, along with a variety of other spring lettuces so fits into my spring pasta salad perfectly. 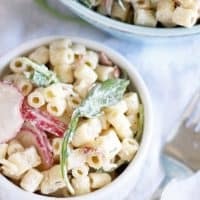 Looking for another pasta salad? 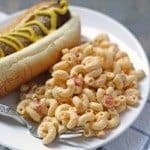 Try this deli-style macaroni salad! Then there are radishes – I just can’t get enough of them! They are so bright and colorful; it’s such a welcome change from the browns of winter. I used shallots for this recipe but if you are lucky enough to get your hands on some early spring ramps, substitute them for the shallots. Ramps would really make this pasta salad a myriad of spring tastes. Also, if you want a creamier salad, you could also substitute regular sour cream or even mayo. Mayo, in my head, cancels out healthy vegetables so that’s why I went with the low-fat sour cream. In a small bowl, whisk together the sour cream, dill, salt, lemon juice and shallot until well combined. In a large bowl, combine the sour cream mixture with the remaining ingredients. Mix well, and refrigerate for 1 hour prior to serving. If you can find ramps, substitute the shallot for 1-2 tablespoons finely diced ramps. 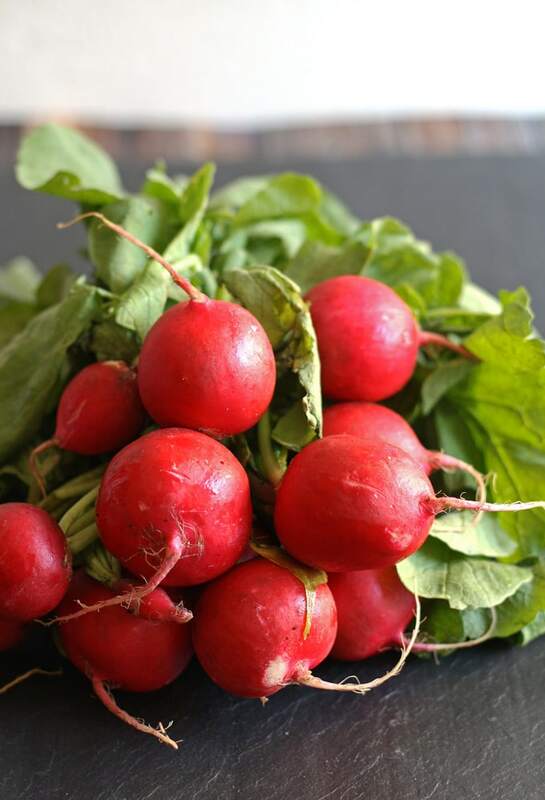 The perfect Spring side dish – love all of the radishes! I am obsessed with radishes right now! Thanks Melanie! This sounds like such a great spring recipe! I love the combo pasta + fresh veggies! Thanks Liz! Fresh veggies make all the difference. So I’ve never had radishes before, but I tell you what, I’m tempted to try them now! Thanks for this great recipe! I hope you like them – they’re crunchy, some are a little spicy and some are a little bitter. Kind of like different kinds of lettuce. Looks so creamy and delicious, every spring I too look forward to the farmers market and all the fresh produce! I know what you mean about forgetting to have a life, I’ve been holed up in my kitchen and behind my camera for too long – the next few months I have quite a few things coming up though! 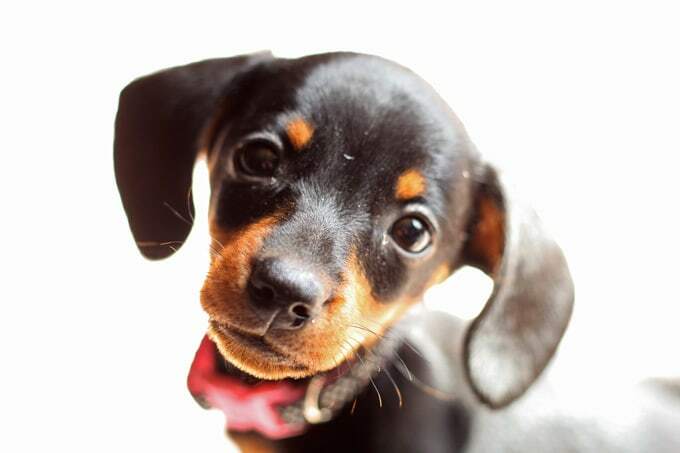 That puppy is adorable, she looks like our Missy! The salad looks amazing, definitely perfect for an end of winter party, which should totally be a thing! So ready for spring and lighter eating. This salad will be perfect. I can’t wait for our farmer’s market to start! Our CSA will start up in June, so that will be nice too. I have really been missing it for a while. Your salad looks wonderful…I don’t often use radishes, but I had some the other day and I liked them. I always thought I didn’t. It’s weird how taste buds change! I think I’m going to sign up for a CSA this year – remind me to ask you about yours! Radishes can be a little weird if you aren’t used to them. They are one of my favorite things in salads though. 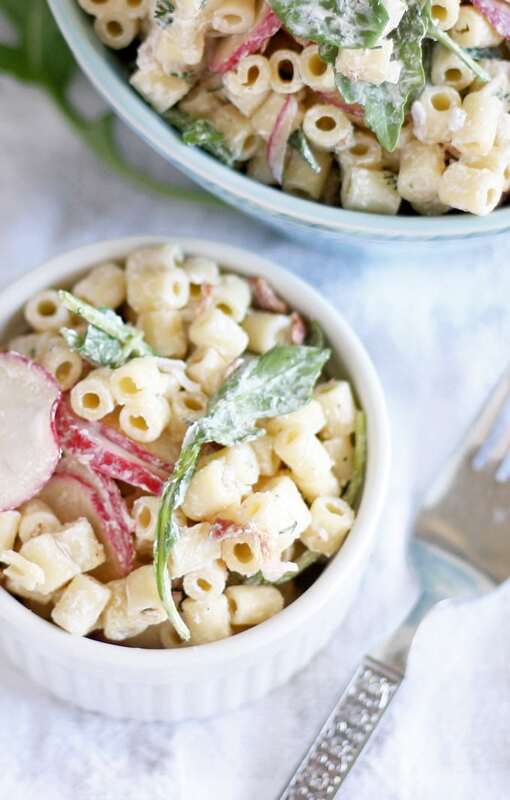 Love love this pasta , what a great idea to combine it with radishes and arugula! Yummmy! PINNED! Your salad looks amazing pinned to try your recipe. That puppy is adorable! Sounds like a lovely time you had. Thank you for pinning Theresa – I did have a great time, thank you! 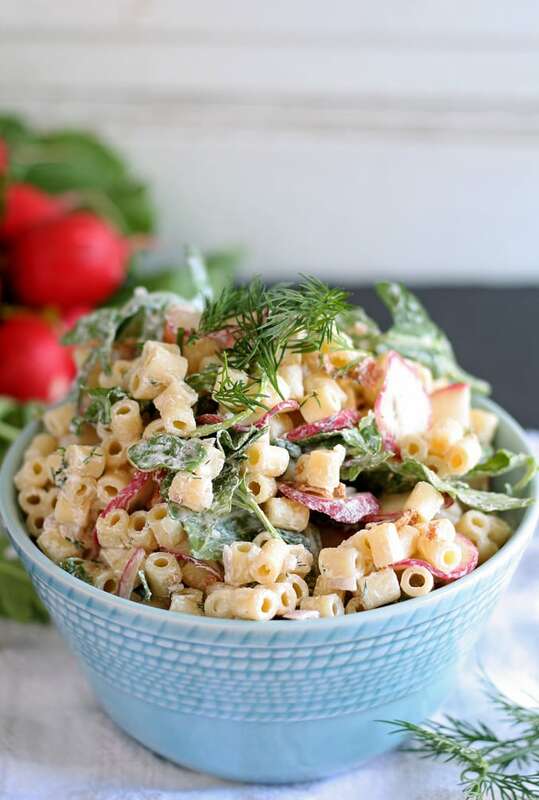 this spring pasta salad looks so refreshing and light! I think this will become a summer fav at my house!